I was called “The Blogger” and yes, I’m known there also as Paris B! 🙂 I’ll try to get a scanned copy up soon (I don’t have a scanner) . My thanks to the lovely Afdeza and crew for the article and pictures and to Ee-Tan for alerting me to the fact the November issue is out! 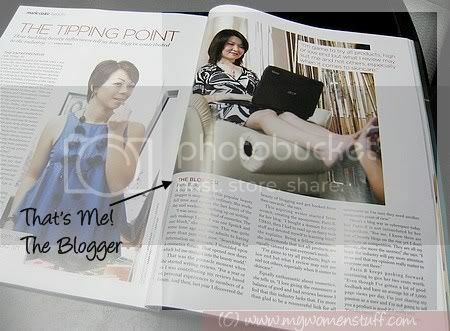 Here’s the scanned article for those who have no access to the Malaysian Marie Claire November 2008. You may click to enlarge. NEXT POST: Help! I’m breaking out! Wow, must scan and show us! We’ve not seen Paris B close up! 😉 But I must say, you’re very fair! Congratz… it feels like meeting my fav beauty blogger in person… keep up the good work… its a nov copy right? @Tine : Thank you! Well there is still relative anonymity 🙂 The scanned version will be up soon. @Affy: How sweet of you to say so. Yes, its the November issue thats just out in stores. Congrats on being featured-very cool! @Monstro : ROFLOL! The sum of parts! 😛 Thanks! @geekchic: Thank you and please do! It’ll help us all. @beetrice: Heh… yeah it was a matter of time I guess 😛 Thanks! WHAT HAPPENED??? WHOLE FACE, OH MY WHOLE BODY???!!! ok, i am dying to see the close-up version. i think i like your hair this way better than when we met up. congrats!!! i should have bought that meg this morning! but i got 2 other different ones. darn it. will head back to the news agent tomorrow. @Smiley : Heh sure thing! @nikki: Haha I think that’s what everyone’s thinking “We’re finally seeing PB!” 🙂 Thanks girl! Scanned version will be up soon. Congrats on the feature… I’m going to pop over to Kinokuniya at lunchtime today to buy the mag and support you!